Chamomile is a pretty herb that graces the herb garden with masses of small, daisy-like flowers throughout much of the growing season. 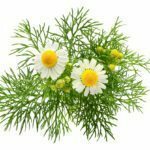 Traditionally, many generations have appreciated chamomile for its curative qualities, and to this day, people rely on chamomile tea to calm frazzled nerves and relax at bedtime. But is chamomile edible, and if so, what parts of chamomile are edible? It’s wise to know the facts before eating chamomile plants. (Caution: Never eat any plant if you aren’t 100 percent sure!) Read on for the specifics of edible chamomile. Yes, chamomile leaves and flowers are both perfectly safe to eat, with a couple of caveats. Be sure the herb hasn’t been sprayed with pesticides or herbicides. Use chamomile with care if you’re allergic to ragweed, as chamomile may trigger allergic reactions in some individuals. Most people use the blooms, as the bright yellow centers have a mild, apple-like flavor. Brown a few crushed or dried chamomile flowers in hot butter, then stir them into oatmeal or other hot cereal. Make chamomile cordial with apple brandy, a small amount of honey and a few fresh or dried chamomile flowers. You can also add orange, lemon, overripe berries, cinnamon sticks or even peppercorns. Allow the mixture to sit overnight to let the flavor develop, then strain. Place the cordial in a clean glass bottle or jar and store it in the refrigerator. Pour the cordial over ice cream or use it as a glazed on desserts. Add a small amount of chamomile flowers to the crunchy topping next time you make apple, peach or berry crisp. Create chamomile liqueur by mixing dried chamomile flowers with vodka and small amounts of honey and lemon zest. Let the liqueur infuse for two to four weeks, then strain well. Infuse chamomile flowers in almond oil. Use the chamomile oil for salads or fish dishes, or mix it in mayonnaise to add flavor to sandwiches. Add a few blooms to add color and flavor to a fresh green salad. You can also use leaves, although they may have a somewhat bitter flavor. Make chamomile tea. Stir two to three tablespoons of crushed chamomile flowers in a cup of boiling water. Allow the tea to steep for five to 10 minutes, then strain and drink. Add honey and lemon to taste, if you like.